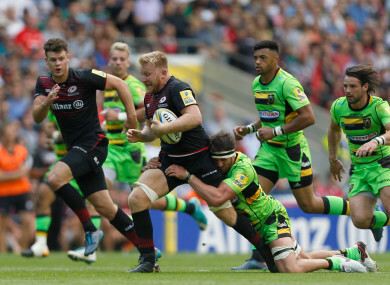 SARACENS MADE A a statement of intent with a 55-24 thrashing of Northampton Saints in Saturday’s Twickenham double-header of Premiership action. The European champions were in stunning form to heap pressure on Saints coach Jim Mallinder and his staff, racking up nine tries in a dominant showing that emphatically earned a bonus-point triumph. After last season’s play-off winners Exeter Chiefs lost to Gloucester on Friday, Sarries underlined their title ambitions in style, with returning British and Irish Lions stars George Kruis and Maro Itoje on show. Sean Maitland’s hat-trick made him the star of a first half in which captain Brad Barritt, Richard Wigglesworth, Alex Lozowski and Vincent Koch also touched down, while Harry Mallinder’s penalty was Saints’ only score in the opening 40 minutes. With a desperate need to restore some pride, the Saints – who failed to live up to expectations with last term’s seventh-placed finish – fared much better after the interval and Lewis Ludlam’s first try for the club was the reward for their efforts. Then, after the on-song Schalk Brits responded for Mark McCall’s men, excellent work from Alex Waller set up a try for Tom Wood, who soon doubled his tally. It was fitting, however, that Sarries had the final say as Ben Spencer dotted down after concerted pressure, while the second match at Twickenham ended in a 39-29 win for London Irish over Harlequins. Dan Robson took centre stage for last season’s table-toppers Wasps as he scored four tries in the 50-35 defeat of Sale Sharks. The scrum-half single-handedly claimed a bonus point for his side, who were beaten by Exeter in last season’s final. Email “Scintillating Saracens thrash Saints as London Irish return with thrilling Twickeham win ”. Feedback on “Scintillating Saracens thrash Saints as London Irish return with thrilling Twickeham win ”.